Oakwood won its first ever cup competition after defeating Hendon in a dramatic penalty shoot-out on Sunday evening. 1) Louie Libbert (Oakwood B) – Wrapped his left foot around the ball from 25 yards for the winner. Oakwood claimed their first cup win after winning the most dramatic of encounters at Rowley Lane. Taking the lead on three separate occasions, through Brad Wine, and two Josh Cuby strikes, two strikes from Avi Korman, the first from the penalty spot, coupled with Yoav Kestenbaum’s 120th minute strike took the ties to penalties. As the floodlights flickered on, an epic shoot-out saw Oakwood goalkeeper Joe Botchin keep out Ben Lauffer to seal the win for the O’s. The Greens ended their season on a high, as they ran out comfortable winners at Rowley Lane. Oakwood ended their season with a win which secured them third spot in the table. Daniel Seligman and Louie Libbert both got on the scoresheet, with manager Jason Stein, who was not at the game, telling jewishnews.co.uk: “Thanks to Daniel Kristall for coming down to help manage the side, along with joint-manager Simon Field in my absence – hopefully the first of two wins for him today. “That was a huge win for us to seal third place. I made it clear pre-match how ridiculous it was that Blancos and Oakwood were level, given they’d had so many walkover wins. And I’m thrilled for the second time this season we’ve come away from them with a win. 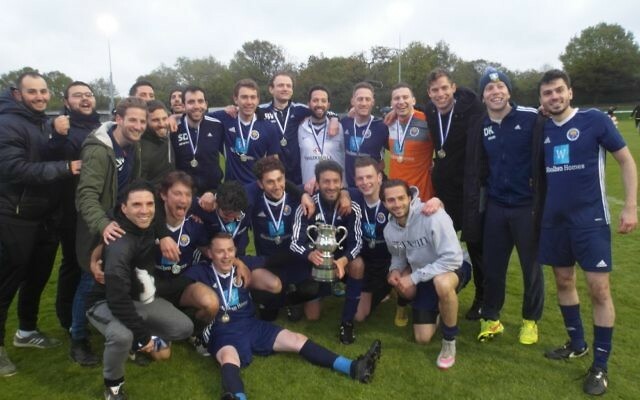 Fairlop moved a giant step closer to securing the title as Daniel Garfinkle’s goal proved to be enough to see them to the win – and move them to within two points of silverware. Manager Aaron Dias told jewishnews.co.uk: “Ahead of this game, the task was clear. Four points required from three games to be crowned champions in our debut season. And now we’re almost there! “It was tricky conditions today, with the grass being heavily overgrown and the delay in kick-off due to players having to remove dog poo off the pitch. You could tell MH Dons were used to playing on this pitch but fair play to them they came at us in the first 30 minutes. But we grew into the game and snatched an undeserved lead before the half. Hendon moved three points clear of Vale with this resounding win. Lolu Hibbert helped himself to a hat-trick, Benni Goldberg scored twice, with twin brother Benny and Joel Kutner completing their scoring. Bradley Lobetta and Simon Englander scored for Vale, for whom joint-manager Jacob Emaunel told jewishnews.co.uk: “We left one of our worst performances of the season to last unfortunately, numerous individual errors leaving us with a heavy defeat with a performance that ultimately deserved nothing. “Heading into the game, we had two late dropouts on top of a large unavailability so we weren’t in the best shape, but we should’ve given a better account of ourselves in a battle to finish as high up the table as possible. 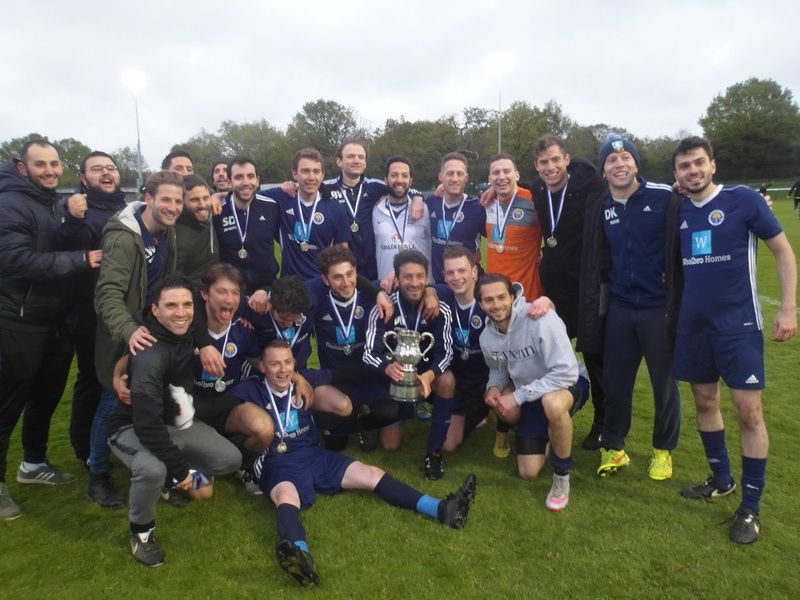 “I’d like to take this moment to applaud my co-manager Danny Hirschberger, club chairman Vivian Emanuel and of course all the players for their hard work throughout the season to take Hertswood Vale to the next level. Compared to last year, we find ourselves 11 points and five places better off and although we’ve finished on a low, the season overall has been successful – we set out to improve on last year and there’s no doubt we did that.